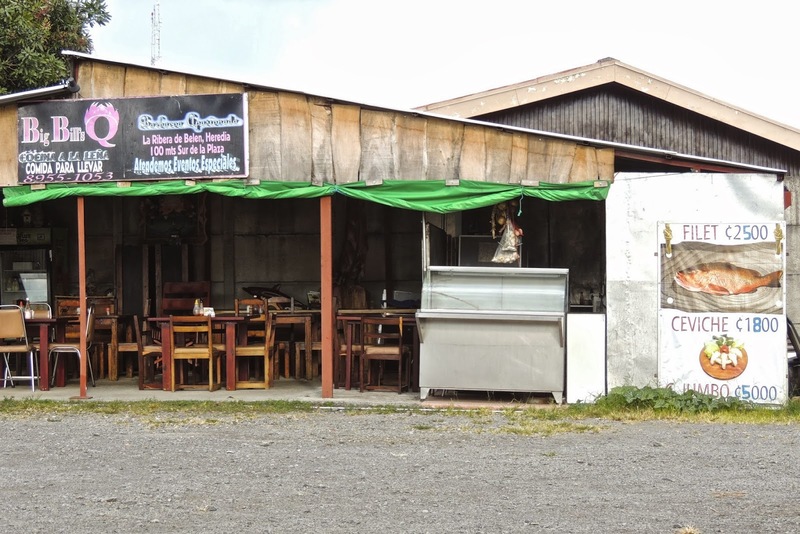 This is a wider view of the barbeque and seafood restaurant that I showed yesterday. 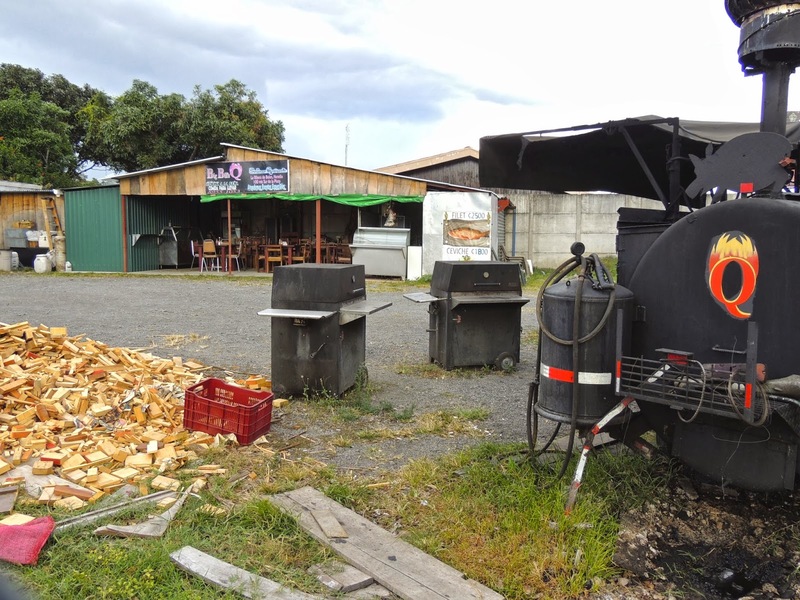 Rather than a kitchen in the back, the restaurant had several barbecue grills across the parking lot next to a large pile of wood chips. I walked by during the afternoon, but I guess during the evening they would grill the food across the parking lot and carry it back to the tables. I have been showing some rather ordinary scenes on this walk in suburban San Jose. After tomorrow's monthly Theme Day, I will show some photos of a surprising sight that I unexpectedly came across while out randomly walking around. This week we are showing photos from our recent trip to the Galapagos Islands on our Viva la Voyage travel photo site. Continuing with my walk in a suburban San Jose neighborhood, I came across this open-air neighborhood restaurant that features both barbeque and seafood. The sign advertising "Comida para llevar" means what Americans would call "Carry-out food" or what Europeans would refer to as "take-away." The fish filet is advertised at about $5 USD and the ceviche is about $3.50. This is another part of the same wall that I showed yesterday. 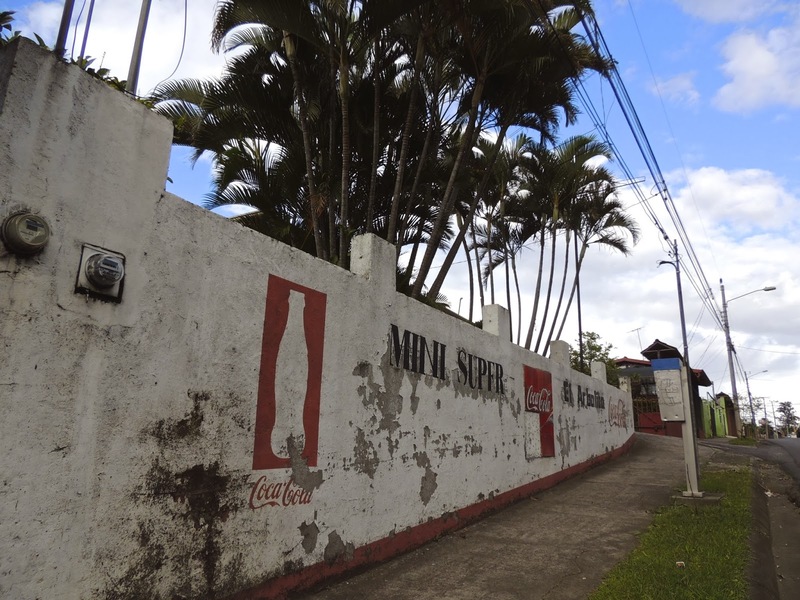 The old advertisement for Coca Cola is missing a few tiles. 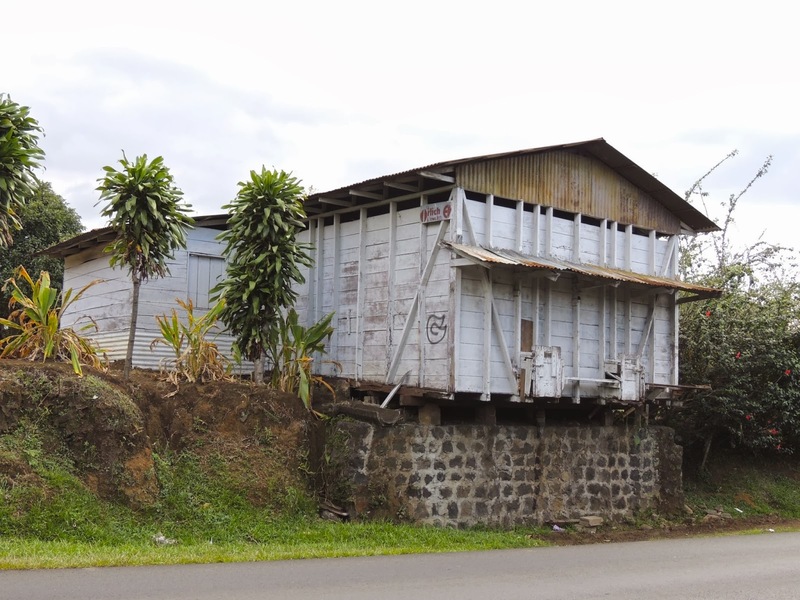 This gives me an opportunity to share another oddity about Costa Rica not using street addresses, but instead people giving directions based on the direction and distance to a landmark that others will know. even print the location "Coca-Cola." To make this practice even more odd, the Coca-Cola bottling plant relocated years ago, but everyone still refers to that part of the city, a busy bus transit area, as "Coca-Cola." 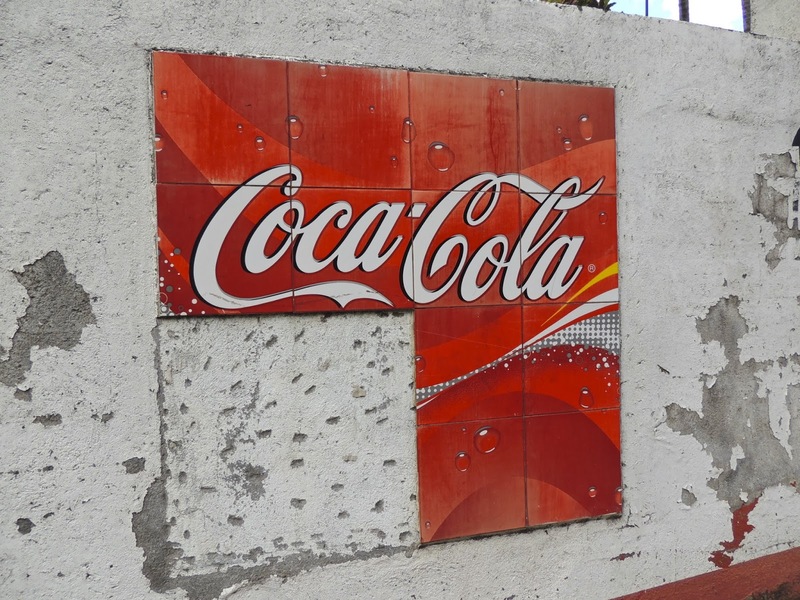 As I walked a little farther from the Marriott Hotel through a suburb of San Jose, I cam across a wall with faded paint advertising a food market, with the universally recognized bottle shape and trademark of Coca-Cola. Tomorrow I will tell the story of why maps of San Jose identify a section of the city as "Coca-Cola." 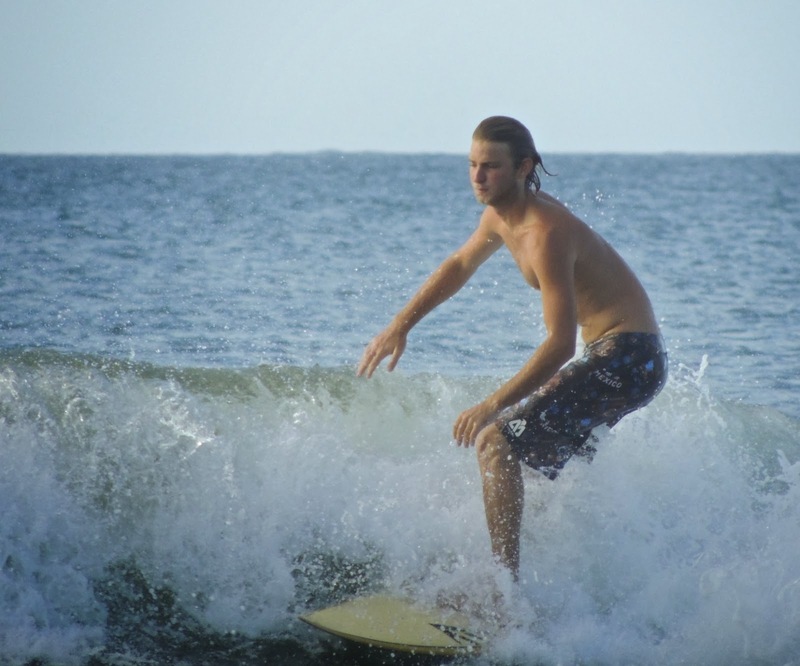 I maintain a practice of attempting gender equality on this website, so yesterday's photo of a female surfer is followed by today's post of a guy surfing at Tamarindo beach. After this little surfing interlude yesterday and today, I will return tomorrow to my series of the sights that I encountered on my little walk in a San Jose suburb around the Marriott Hotel where we stayed. As another interlude in the rather pedestrian series I have been showing from a walk in suburban San Jose, here is another surfing photo from Tamarindo. Today is Sunday, so we have new posted on our Viva la Voyage travel photo site. This week we are showing photos from our recent trip to the Galapagos Islands. This is the rest of the pet store whose sign I showed yesterday, which was located in a typical suburban strip shopping center. This week we have photos of the giant tortoises of the Galapagos Islands posted on our Viva la Voyage travel photo site. Continuing on my walk in suburban San Jose, I noticed this sign in front of a pet store. 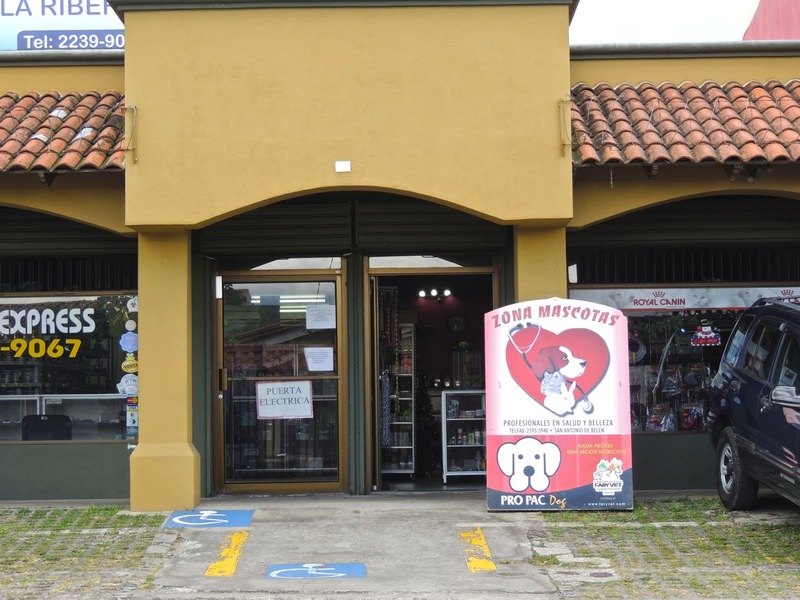 Pets are popular in Costa Rica. In fact, the government has a campaign underway to discourage people from keeping exotic or non traditional pets. 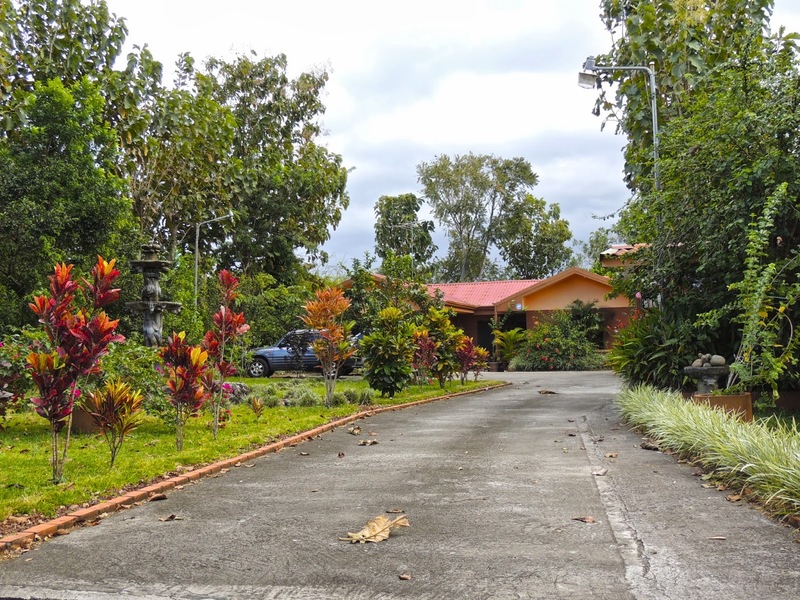 Cats and dogs are fine, but because there is so much wildlife in Costa Rica, some people keep monkeys, sloths, or other animals in their yards. The government's campaign to discourage keeping animals in captivity has even gone so far as to threaten to close the zoos. The area around the San Jose Marriott is suburban now, but it evidently used to be a rural agricultural area, as evidenced by this old barn right on the main road. In comparison with yesterday's photo, this is a more typical suburban San Jose home. 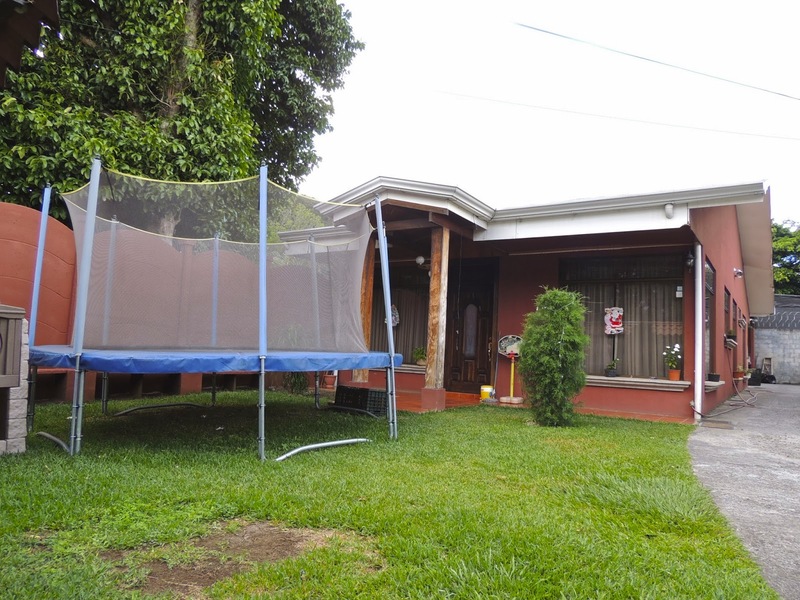 This family has a trampoline in their front yard, with protection to prevent children from falling off. Smart. I took this photo a little before Christmas, so there is a holiday decoration in the window. Continuing with this series from a walk in suburban San Jose, this is a photo of a house. It had a gated driveway leading back to the home. There is a fountain in the front yard on the right and two tall street lights on their driveway. This house is nicer than most of the houses in the area, and I will show more in the days ahead. Because you have endured a series of photos showing suburban cows, I thought I would show a Tamarindo surfer today to interrupt my little series of the scenes that I encountered during my walk from the Marriott Hotel near the airport in San Jose. The cows evidently became impatient while waiting to be fed and briefly fought for position. Today is Sunday, so we have new photos posted on our Viva la Voyage travel photo site. This week we are showing photos of the giant tortoises of the Galapagos Islands. 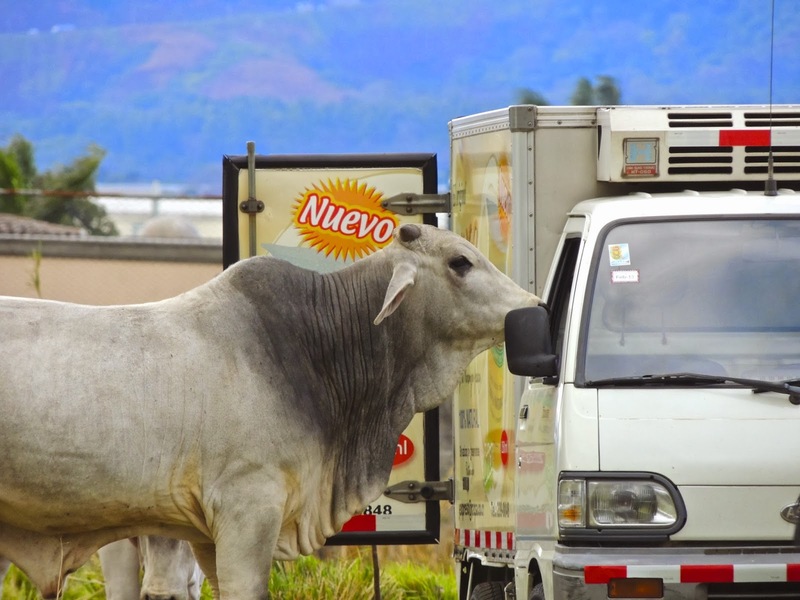 This cow seemed to get tired of waiting for the man to bring food from the back of the truck, and he checked out the cab to see if there was anything in there to eat. This week we have photos of the Sepik River tribes and villages posted on our Viva la Voyage travel photo site. Today is Valentine's Day, so I am taking a break from the series of photos in suburban San Jose to show a young couple on Tamarindo beach. Here is a nice story for Valentine's Day. Four years ago a young woman rented my condo as a present for her boyfriend before he returned to duty in Afghanistan. She called me recently to rent the condo again later this year because they want to get married in Tamarindo. She explained that she wanted to return to my condo because "That is where we really fell in love." Referring to her earlier decision to surprise her boyfriend with the vacation in Tamarindo, she said "it worked." 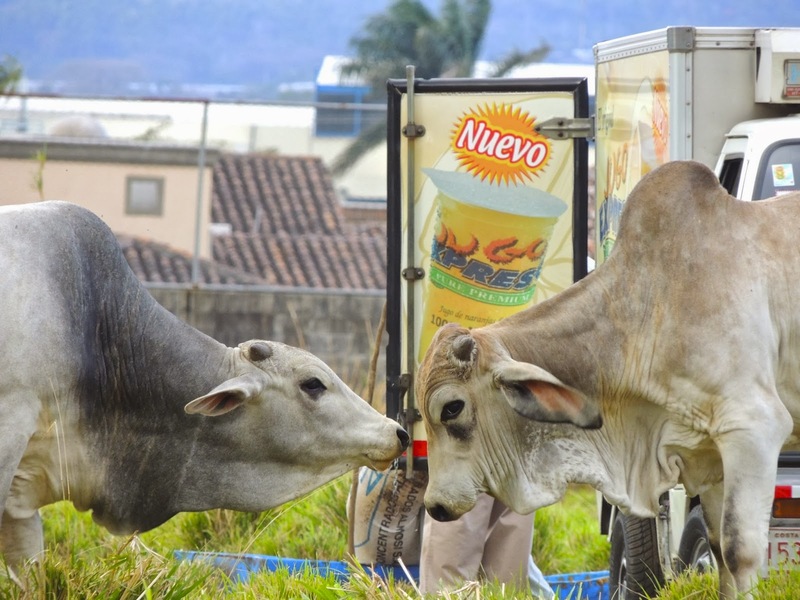 These cows seemed to be paying attention to each other as they waited for the man to unload some food from his truck. We will see if the cows share nicely. These are brahma cattle, with their characteristic long floppy ears, boney hump at their shoulders, and loose skin under their chin. Brahma are well adapted to warm and humid climates. 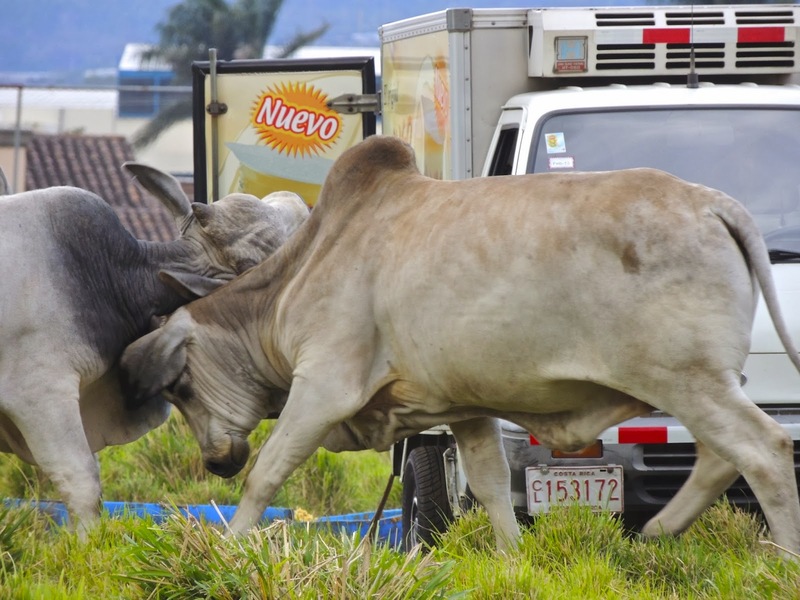 The rural, agrarian foundation of Costa Rica was evident even in a short walk from the Marriott Hotel near the San Jose international airport. There was a pasture with some cows just a block from the hotel. 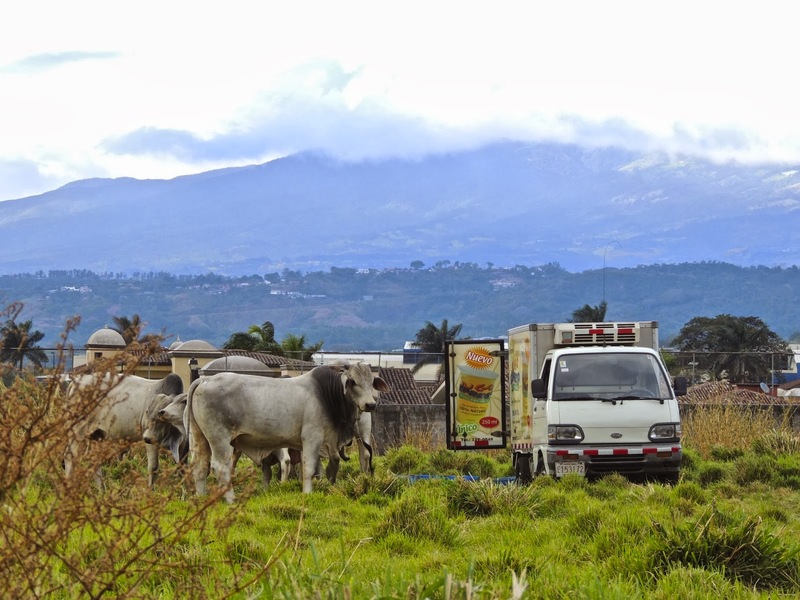 The truck held some food for the cows that a man was delivering. I guess sophisticated suburban cows are not content to eat only lush grass, and they want some additional food. 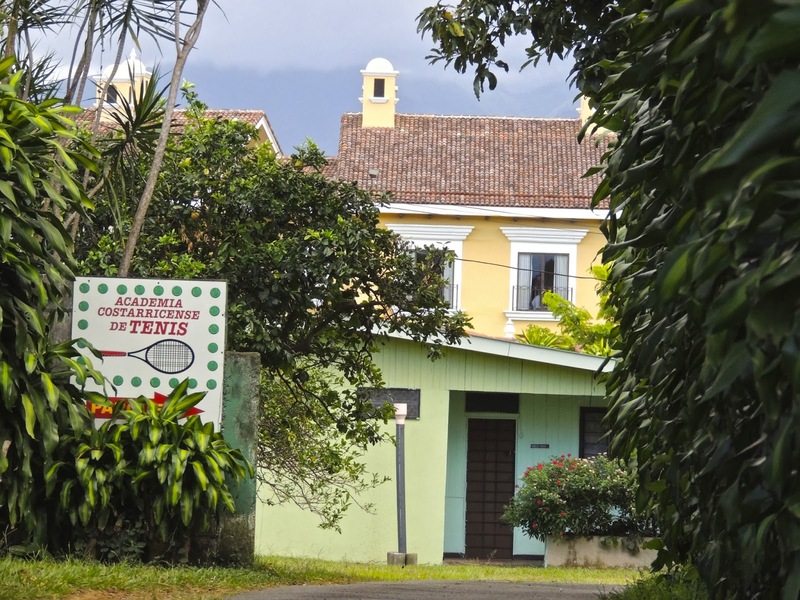 Walking down the street from the Marriott Hotel, I was surprised to see a house with a sign announcing that it was the Costa Rican Tennis Academy. Tennis is not a major sport in Costa Rica, but it is good that there is an tennis academy to develop local talent. 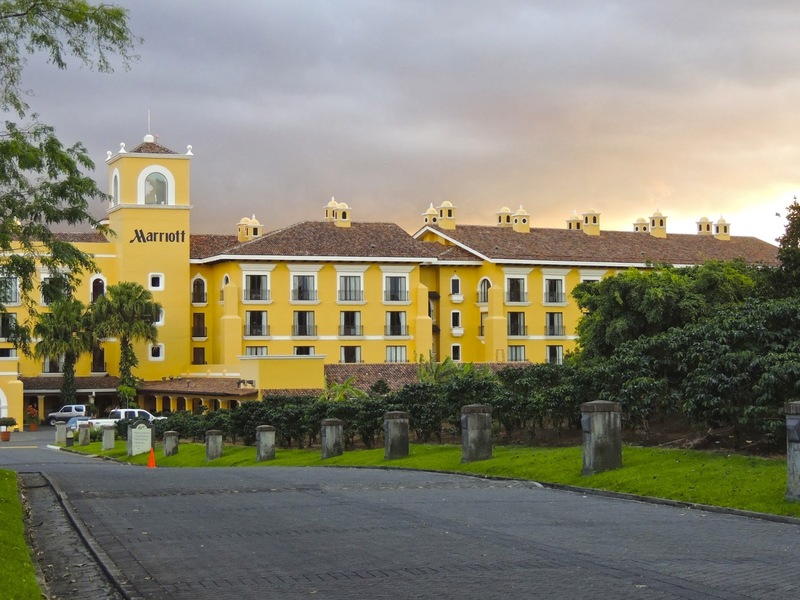 The Marriott Hotel near the international airport on the outskirts of San Jose is located in what used to be a coffee plantation. 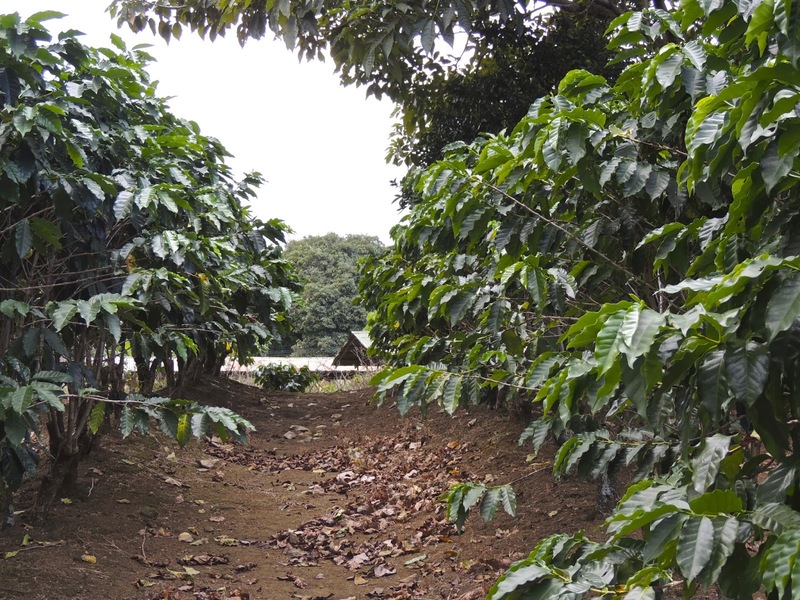 The driveway was lined with coffee plants, as this photo shows. Tomorrow, we will begin exploring the area outside the hotel. I am starting a new series today from a visit that Julie and I made to San Jose. We stayed at the Marriott near the international airport, which I am showing to begin this series. 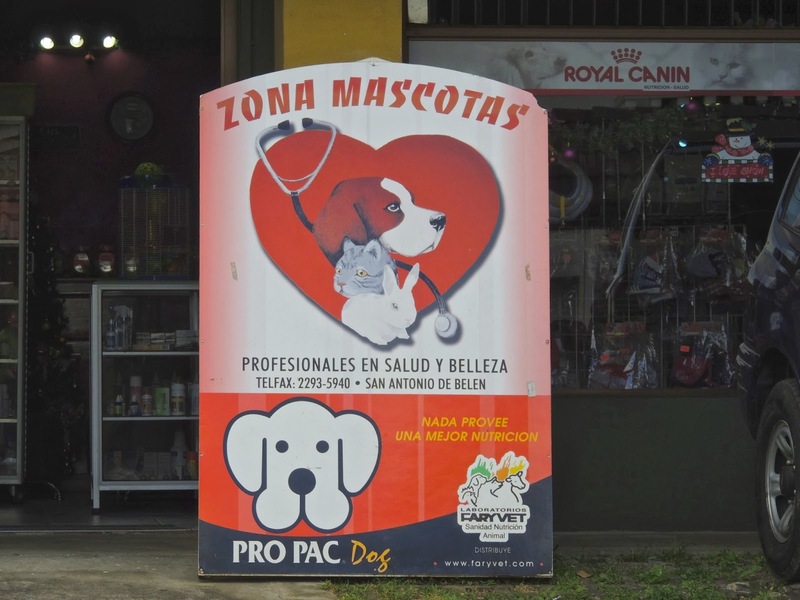 I have mentioned previously that Costa Rica does not use street addresses, but instead people give directions from a place whose location everyone will know. If you go on the Marriott website, it will give the "address" for the hotel as "700 meters west of Bridgestone/Firestone." The Bridgestone tire factory is next to the freeway that leads to the airport, so everyone knows where it is. Tomorrow I will show what surrounds this Marriott Hotel, then I will show some photos from a walk around the area. Today is Sunday, so we have new photos posted on our Viva la Voyage travel photo site. This week we are showing photos of the Sepik River tribes of Papua New Guinea. 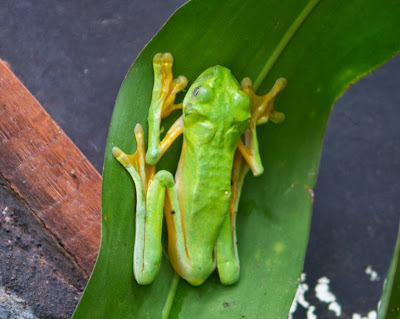 This frog is well camouflaged to spend his time on a green leaf. This week we are showing another set of underwater photos from our recent trip to the Galapagos Islands posted on our Viva la Voyage travel photo site. 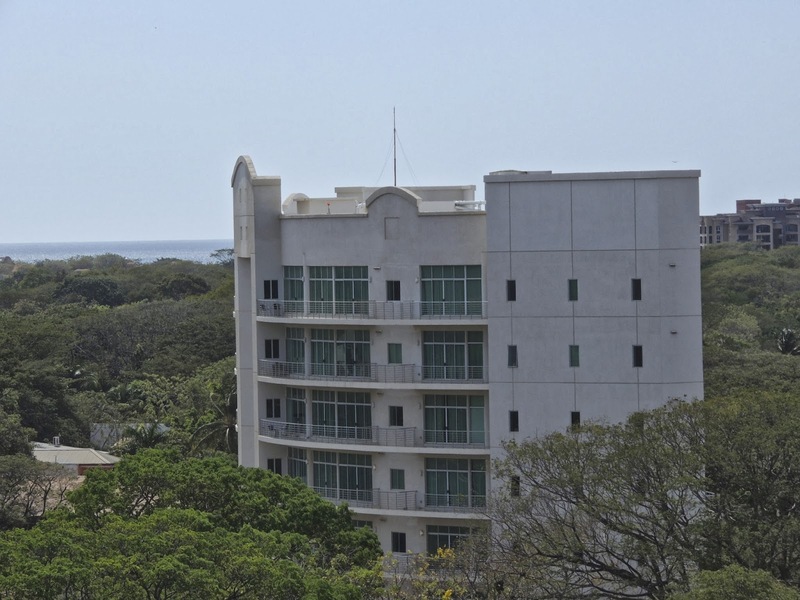 This is a view of the Pacific Park condo building, located at one of the two main intersections in Tamarindo. The balconies that you see in this photo face the hills around Tamairndo. The balconies on the other side of the building have a view of the ocean, which is about a block away. This is another example of a large condo project that came on the market at about the same time that the recession hit. I hope the market absorbs these units. My own personal preference would be for the condo building to be a color that blends in more with the surrounding, as the white stands out and is very visible, even from a distance. 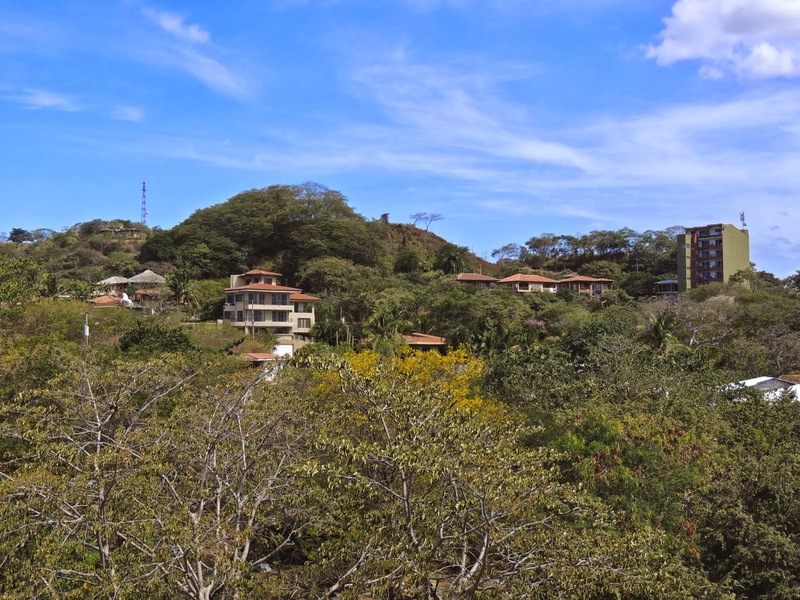 This is a view of the hills above Tamarindo. Houses and condos have been built up into the hills to take advantage of views of the bay and ocean. I personally prefer to have a condo close to the ocean instead of up in the hills, as I would rather walk along the beach and to see the ocean close up, rather than to look at it from a distance. It is possible to drive up the tower in the far distance, which provides a panoramic view of the area. At times we go up there to watch the sunset. 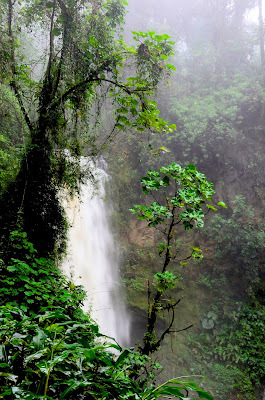 For a little change of pace, here is another photo of a waterfall in the jungle at the La Paz Waterfall Gardens near San Jose. The Midwest and East Coast of the USA is getting pelted with yet another snow storm this week, and Tamarindo is right in the middle of our warm, dry season, so as a contrast I offer this photo of a waterfall in the clouds and rain. Several of the guests who will be staying in our condos in the upcoming months have commented to me recently about how much they are looking forward to beach vacations in the warm sunshine of Tamarindo. For the last two days I showed views from the walkway in front of our condo at the Tamarindo Diria Resort, so today I am showing this little view of an architectural detail from the balcony of our condo. 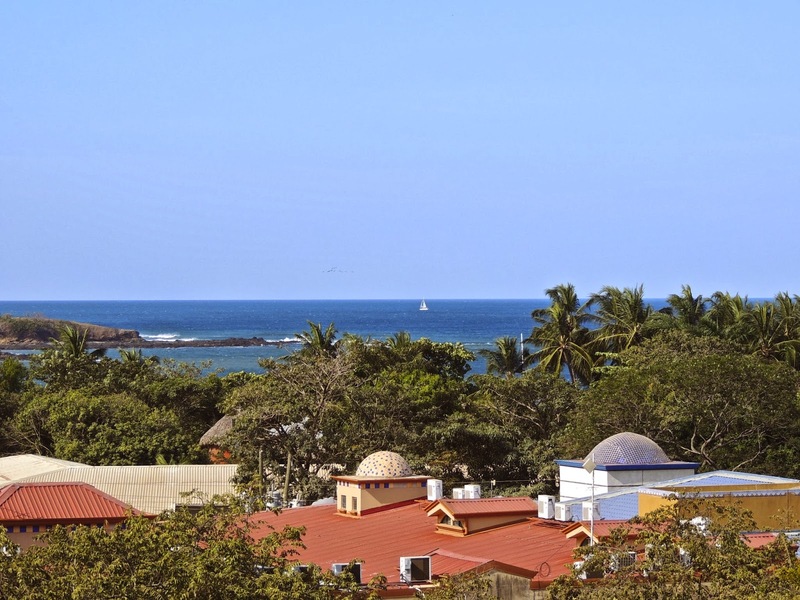 This is a view of a part of the rooftop of the Tamarindo Diria Hotel buildings. 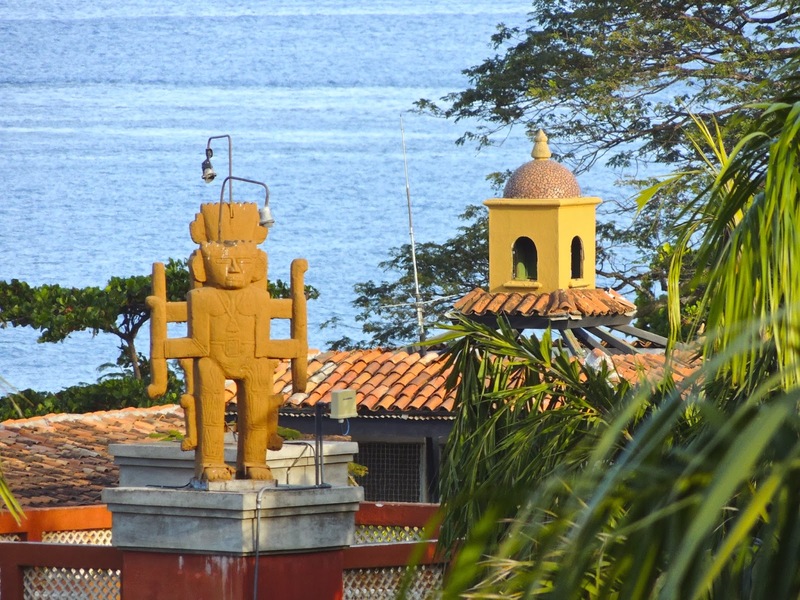 I like the pre-Columbian decorative features and the Spanish colonial design elements. I also like the fact that our condo is on the 4th floor and the condo building sits on higher ground so that we have views over the hotel buildings to the beach and ocean. This is a wider view of the same scene that I showed in yesterday's photo. If you look closely, you can see the sailboat near the horizon in the center of the photo. We usually look out our back patio to the beach. This is a view from our front door out to the ocean towards the southwest. The roofs of the buildings in the foreground are stores. This demonstrates the power of the 42x zoom on the little Nikon CoolPix 512 camera that I use when I do not want to carry my DLSR with its heavy camera body and lenses. The photo yesterday and today demonstrates the versatility of the camera. Its lens goes from a macro setting, to wide angle, to a very powerful telephoto. The sailboat in yesterday's photo would normally not even be a subject for a photo from this vantage point and distance except with a camera with such an amazingly powerful zoom. The 42x zoom is the equivalent of a 1,000 mm lens. After seeing my photos, Sharon of Phoenix Daily Photo bought the same model, as have several other people to whom I have recommended the camera. I think Nikon should give me a commission. Today is election day in Costa Rica. There are abotu a dozen candidates for President with three of them leading the others. If no one gets at least 40% of the vote, there will be a runoff election between the two top finishers. 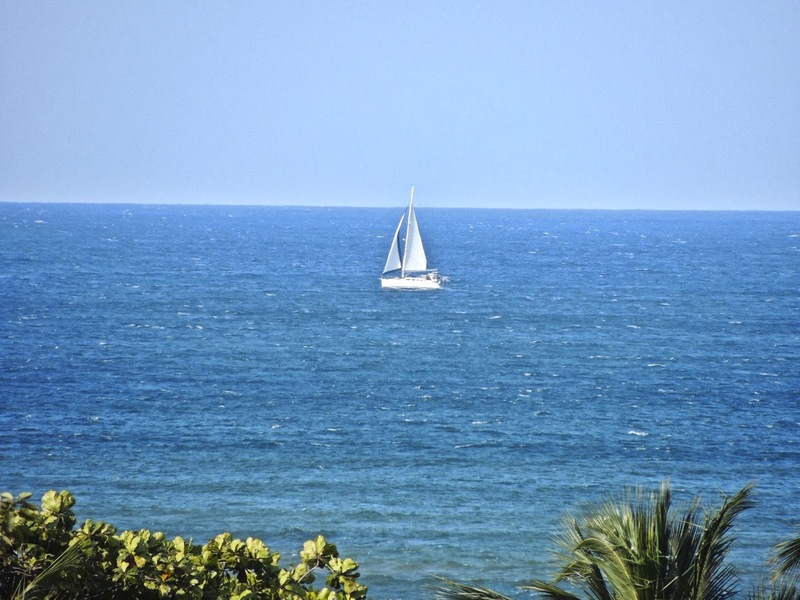 Everything should be smooth sailing for the election, which I syhmbolize with theis photo of a sailboat from our condo a the Tamarindo Diria Resort. Costa Rica has had democratically electyed governments and peaceful transitions of power since 1949. It is the only country in Central America to do so. Today is Sunday, so we have new photos posted on our Viva la Voyage travel photo site. This week we are showing another set of underwater photos from our recent trip to the Galapagos Islands. The worldwide theme for Daily Photo websites for February 1 is "Entry." This is the roadway entrance to the international airport in Liberia. It has one of the stone spheres that date to as old as 200 B.C. There are about 300 of them in Costa Rica. 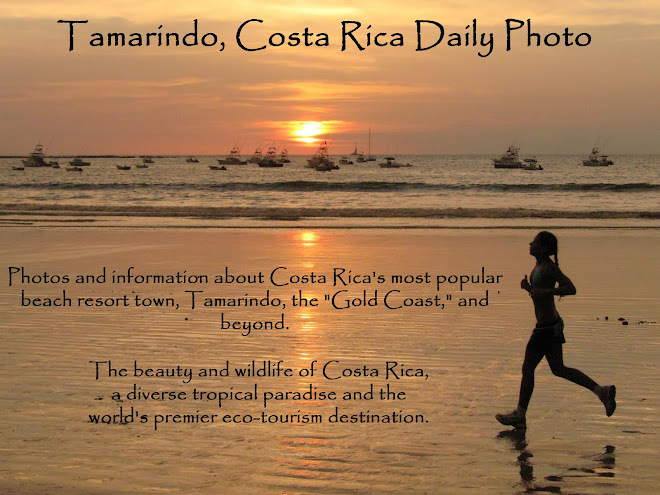 There are two in Tamarindo, which I have shown in the past, although this one is larger. The largest ones are about 2 meters (6.6 feet) in diameter, weighing 15 tons. They have been unearthed at many locations scattered round Cost Rica, including the around the Gulf of Papagayo, which is very close to Liberia. The opening scene from the first Indiana Jones movie featured one of these stones. 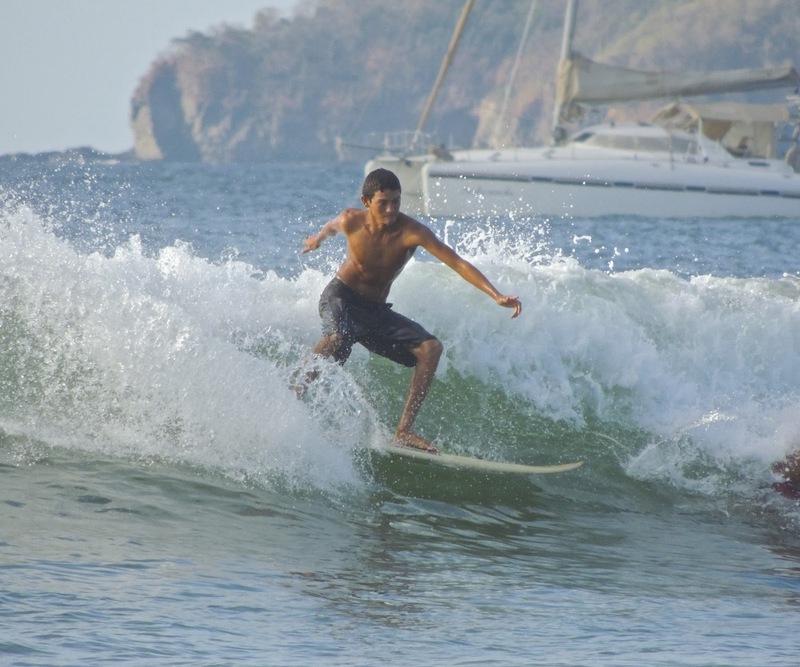 This week we have photos of Grenada, Nicaragua posted on our Viva la Voyage travel photo site. To see how other City Daily Photo bloggers have interpreted the theme of "Entry," use this link.